Boston Walk-In Bath and Stairlift Company offers Portable and Modular aluminum wheelchair ramp systems. We are proud to offer ramps that are American made. Our modular and portable wheelchair ramp systems are strong, durable, and are affordable enough to make it the best alternative to provide quality functional access to many areas. Designed to address the accessibility needs of the residential and light commercial market, our Ramp Systems are an excellent choice when accessibility is needed. Made of aluminum, unlike wood that may be treated with toxic chemicals or steel that is subject to rust and decay, aluminum has excellent corrosion resistance and is environmentally friendly. They are architecturally designed for a clean, low maintenance, modern appearance and have weight capacities as high as 850 lbs. Their permanent non-skid surface and rust-free aluminum construction make them perfect for our brutal New England winters. Modular Ramps are as customizable and unique as every situation needing one. 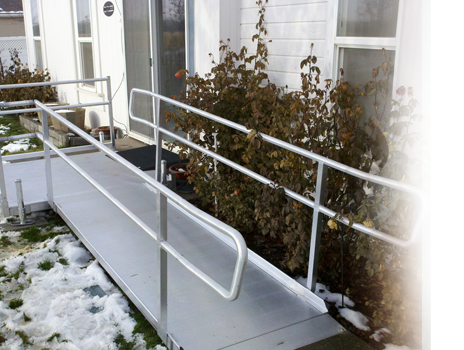 Modular Ramps can be easily installed and there is little to no site preparation required. Fastest and Easiest modular handicapped ramp installation. Please call us at (781) 229-0072 today to arrange a FREE home evaluation.